The Sword of Durza has an evil and twisted look about it, appropriate for the blade favored by Durza the Shade. A powerful sorcerer who became possessed by the spirits he summoned, Durza becomes one of the most dangerous opponents of the Dragon Rider Eragon. The 41-1/2-inch Sword of Durza tapers to a needle point. The double-edged blade of high carbon stainless steel is built with rat tail tang construction and cast metal cross-guard, grip, and pommel. The intricate surface texture of the cast pieces resembles twisted wire. Claws decorate the tips of the guard, and the pommel represents a dragon's clawed foot. 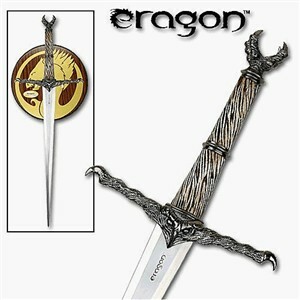 The word Eragon is etched at the base of the blade. Durza became one of the chief antagonists in the story of Eragon -- the highest grossing "dragon-centered" movie of all time and number two in the swords-and-sorcery category. Though his role in the story was that of an evil shade, he began his magical career as an innocent orphan who tried to avenge the death of his sorcerer benefactor by summoning spirits too powerful to control. The officially licensed Durza Sword set includes a hardwood wall plaque for displaying the sword, all mounting hardware, and a certificate of authenticity. Owners also receive a leather-bound hardwood scabbard. For another fine replica sword in the Eragon series, see the Zar'roc Sword of Eragon the Dragon Rider.